It’s hard to believe Kirby has been floating around our screens for nearly 25 years. In that time not much has changed about Kirby’s main objective - gobble enemies, steal powers, and take down the occasional angry tree. The iconic pink puffball has returned to his handheld home with Plant Robobot, a game that looks and plays quite similarly to 2014’s Kirby: Triple Deluxe. Though it should be noted that Kirby’s mega-sucking “Hypernova” ability has been completely dropped in lieu of his new robotic outer shell. Is it a Kirby title worth playing or just another forgettable romp through Dream World? From being made of clay and rolling everywhere to splitting into an army of doppelgängers - the folks at HAL Laboratories have have tried some interesting Kirby gimmicks over the years to keep players engaged in the series. Sometimes these new abilities pay off and other times they can seem a bit forced. This time around Kirby can hop into large robotic suits to propel himself (sometimes literally) through the game’s colorful levels. Players may be a bit apprehensive about this aspect until they hop in a mech for the first time. Then it becomes abundantly apparent that it is one of the most satisfying Kirby additions in years. It should be noted that Kirby is not always in a mech. In fact I would say for the majority of the game, maybe 60%, he’s floating around without one. The mechs pop up during specific stretches of levels and work much like Kirby himself, absorbing enemies and duplicating their abilities, though this time with some robotic flair. Not every Kirby power can be transferred to the mech portions of the game, but there are plenty to keep things interesting. Flailing laser swords, bomb cannons and enormous brick fists are just a few of the ways Kirby mechs can plow through oncoming enemies and obstacles. There are even special forms that let Kirby fly, transforming the levels into temporary shoot’em up air fights. It’s all very well done, and players will continually look forward to seeing the hulking metal suit waiting for their arrival. It wouldn’t be a Kirby game without a few key details. Everyone’s favorite ever-hungry hero is still hopping and bopping his way across food and outer space themed stages while battling the forces of evil (and unsuspecting Waddle Dee bystanders). It’s a formula that has worked for Nintendo since 1992 and it still holds up. The added mech abilities break up the normal floaty adventuring in a nice way, forcing players to think about how they will destroy certain walls, find hidden items, and swiftly defeat oncoming baddies. The mechanic to jump between the foreground and background has returned from Triple Deluxe and it adds a bit of depth (pun very much intended) to the gameplay. Though there have been a handful of Kirby titles that don’t involve stealing abilities from enemies, games like Super Smash Bros. have pushed it as Kirby’s signature attribute. I was a bit crestfallen to learn we were only getting three new powers this time around, but boy are they unique. Psychic Kirby (who bears a striking resemblance to Ness of EarthBound fame) can shoot a controlled ball of psychic energy from his brain, as well as teleport short ways away. Poison Kirby can spout vile fluids from his skull crown, spit a cloud of poisonous gas, and even surf on a wave of sludge to take down nearby opponents. Doctor Kirby, the best of the bunch, does exactly what doctors do everyday. This includes chucking pills at people, mixing up explosive beakers, and of course, smacking people upside the head with a large clipboard. Planet Robobot showcases some stellar new tracks and puts a nice techno spin on many of the well-loved Kirby tracks of yore. The tune above, “Green Gears”, is a play on the classic “Green Greens” from the oringal Kirby’s Dream Land and... pretty much every title since. There’s plenty of upbeat melodies and technotronic beats to consider Planet Robobot’s soundtrack another rousing success for composers Jun Ishikawa and Hirokazu Ando. I’m always first to downplay the 3D aspect of the 3DS when it comes to suggesting the handheld to others. Does it add much to the gameplay? Not really. I could count on one hand the number of titles I feel are worthy of cranking up the slider, and Planet Robobot is one of them. The 2.5D perspective and focus on switching between level planes leads to some very subtle but effective 3D visuals. Sometimes Kirby gets smashed into the screen by moving vehicles or giant towers of ice cream fall and splatter the screen, but even then the effects are well executed and enjoyable. Aside from the main adventure there are two side games available from the start and two bonus modes available after completing Kirby’s campaign. There’s a shorter Meta Knight adventure, a boss battle gauntlet, and a very simple 3D excursion where players must destroy all the enemies in an actual three dimensional landscape. The stand out is Team Kirby Clash, a multiplayer Dungeons and Dragons type game where players choose from one of four classes. Each Kirby has their own strengths and weaknesses and the group must work together to take down various bosses from Kirby history. It’s legitimately fun, and does take a bit of teamwork to defeat some of the more difficult monsters. The big issue is that it only lasts six rounds, which is heartbreaking considering all the opportunities a mode like Clash has to offer. Maybe we’ll get a full scale title in the future. Here’s hoping. Chances are players can’t recall a specific storyline from a Kirby title they played in the distant past. That’s because they’re all pretty much the same. Unforeseen evil forces show up unexpectedly and mess with the world in some whacky way, Kirby becomes aware of this and sets off to save the day. In this case the evil force are aliens who wants to take over Kirby’s homeworld with their technology for business purposes. Seriously. It sets the groundwork for the level and enemy design, but it’s otherwise forgettable. Kirby titles, much like their titular hero, are usually on the shorter side. Planet Robobot follows suit with seven main worlds, each with a handful of stages and a boss battle for good measure. It won’t take experienced platformer fans long to work their way through the whole game, though collecting all the code cubes and stickers in each level may slow them down a bit. The extra modes mentioned above do a nice job of extending the overall length of time you’ll want to spend with Kirby on his newest adventure. While the 3DS has had amiibo support for under a year, Nintendo is boldly taking advantage of the (slowly dying?) toys-to-life craze. Planet Robobot releases with four new amiibo for collectors to fawn over, and as a bonus they work in the game. Exciting! Kind of. While any amiibo off the street will give Kirby a random temporary power-up from the game’s enemies, actual Kirby-related amiibo will give him unique powers such as... looking sort of like Meta Knight. The best one is unsurprisingly the oringal Kirby amiibo, who gives players the ability to pull off all his Smash Bros. moves. Pretty nifty! 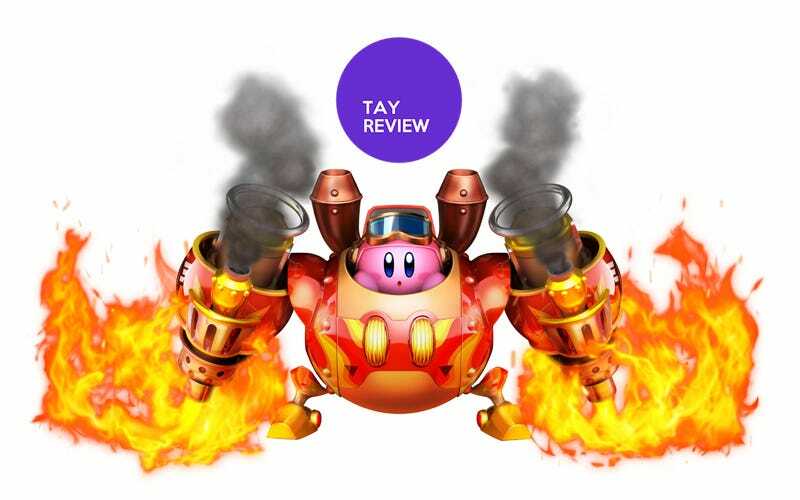 Kirby: Planet Robobot seems like a title that is playing it safe, but it goes above and beyond when it comes to keeping players entertained and moving forward. I found it much more enjoyable than Triple Deluxe and Rainbow Curse, Kirby’s most recent outings. The fresh mech twist and a few new abilities coupled with creative level design and a cheery soundtrack make Planet Robobot the best Kirby title since Kirby Super Star graced the Super Nintendo twenty years ago.